the arts | Connect. Evolve. Thrive. It is a command for drivers to take note and slow down. But it might also be a reminder to parents and teachers as well. Slow down- our children are at play. Or at least they should be. Sadly, what strikes me when I see the signs is the absolute absence of children playing. In the afternoons neighborhoods that once echoed with the boisterous cries of children are now eerily silent. Children are at activities- from soccer, to dance, to football, to violin, to math Olympics, to tutoring in foreign languages. Our children are so busy being prepared to be talented adults (or excellent college applicants) that they are seldom allowed to be children. And it’s funny- because I know a lot of unhappy adults who look back nostalgically on their own childhoods when they were carefree. But our children are not carefree. They are stressed and over-scheduled. They are tested and quantified. They are seldom at play. Perhaps it is a result of our collective anxiety. The job market is tight and the world seems ever more competitive. We are anxious about our own futures, and are thus also anxious about our children’s. We want to give them that edge that we lack (maybe if we had been fluent in Chinese we would have gotten that promotion). Or maybe we are so miserable ourselves that we can’t stand seeing children happy. Maybe their carefree laughter is painful to us because we don’t make time for it in our own lives. But play and downtime are necessary for children- especially as the common core pushes literature, and the arts, and recess out of our kids’ school day. Ironically play is also essential for global competition. Unstructured play gives children the opportunity to make (and break) their own rules which in turn fosters creativity and that ever sought after “outside the box” thinking. Play helps children develop independence and self-reliance because children at play are entertaining themselves and do not need adult supervision (or help) to do it. Play encourages problem solving and develops a sense of internal locus of control- a measure of your belief in your own ability to control events in your life which psychologists find relates to happiness, well-being and lower levels of depression and anxiety. We are moving so fast that our children never get to slow down- to be children at play. The result is that they lose the capacity to play. They become the zombies that haunt our popular culture– drones in the world- marching aimlessly and endlessly towards some elusive (and destructive) goal. There are many reasons we do not allow our children to play as they used to; Dual career families (by choice and by necessity) seek out structured activities to keep them occupied during work hours, a culture of fear that makes us believe our neighborhoods are under siege (when in fact crime has been falling for the past 20 years), and a particularly corrosive culture of competition that permeates affluent communities. We may not even notice how little our children are playing, because we ourselves work so hard and play so little. But children are the canaries in the coal mine. Rising rates of teen suicide and suicide attempts as well as high rates of childhood/teen depression and drug addiction should warn us that what we are doing is not good for them, and indeed, it is not good for us (adults have seen similar rises in suicide and drug use). 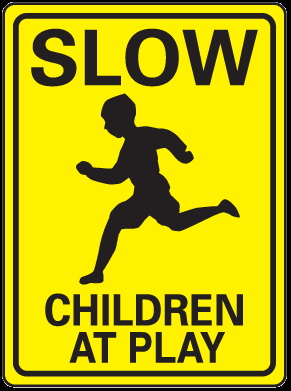 We need to the see the street sign as a command- Slow Children at Play. Slow down- let your children play. Slow down, let yourself play. 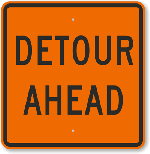 Even if it does mean taking a Detour. This weekend I went to the see the newest X-Men movie (X-Men: Days of Future Past) and after sitting through endless previews for depressing action movies and the dark vision of the film itself, I found myself feeling pretty hopeless. Our entertainment environment is filled right now with apocalyptic and post-apocalyptic imagery. We conjure flawed super heroes to fight cunning and powerful villains or watch the “everyman” fight off a zombie mob. You might say “it’s just the movies (or TV),” but the truth is that our entertainment feeds and expands upon our fears. Our ultra-violent and dark popular culture speaks to and from our collective anxiety. A jobless economic recovery, a world overrun with war, shooting sprees that leave children and young people massacred, a government that spies on its enemies and citizens alike, corporate cultures that demand long hours with increasing job instability- all of these conspire to make us feel vulnerable. Our entertainment is filled with stories of heroes (either super or home-grown) who are able to survive and conquer these forces. We turn to fiction for heroes because they seem so elusive in our own lives. There is no better distillation of this fear than the zombies who inhabit our entertainment- from The Walking Dead to World War Z to any number of video games. Zombies are people who have ceased to be human. They are unstoppable mindless drones who have the ability to turn healthy independent people into the shuffling undead. Zombie movies are a fun house mirror of our fears- that our world has spun out of control and that we are being turned into zombies. Schools prepare our students to be good workers and work demands that we surrender our autonomy and creativity and become mindless drones. We fear that we and those around us are becoming zombies. We fear that we have become the shuffling undead. In popular culture the only way to resist the zombie horde is to resort to hiding and violence. The siege mentality of zombie films is again a mirror of our own mentality- looking out only for ourselves, pitted against our neighbors and friends for scarce resources- fighting over the division of the pie and not attempting to make the pie bigger. Our zombie entertainment reflects our fears. But we have choices. We can, of course, surrender and become zombies ourselves or we can resist. But we do not need to resist as our entertainment counterparts do- by building fortresses and stockpiling weapons. Rather the way that we can fight is by becoming more intensely human. We can reach out to our neighbors and to strangers with kindness and not suspicion. We can seek out moments of connection with one another. We can stop and appreciate the arts- by listening to music, reading a book or creating something (paintings, sculptures, collages- whatever!). We can stroll calmly and slowly out in nature. We can turn off our cell phones when we come home and make the office wait until tomorrow. We can insist on our own humanity and we can resist fear. It is not easy. Zombies have captured our imaginations because we live in dangerous and uncertain times. But if zombies are the undead, we must fight them and what they represent by becoming more fully alive.